With women empowerment being the newest, trendiest topic on the block, we are finally getting to see the much awaited changes taking place in the world, with regards to the rights and abilities of a woman. Women are back in the professional game, we might even say, they are back with a bang! So now that most of the women are getting the opportunity to showcase their skills and talents at work, how does one deal with the various work cultures and what is deemed as ‘appropriate’ outfit to wear at the workplace? What a Midi Length Skirt Is? Midi skirts are the latest trend now- medium length skirts which go till the knees, or just a few inches above or below the knees. They can be plain, printed, pleated, tight fitting, loose and flowy, in block prints, solid colors, sky’s the limit with these wonderful things. Many might feel that wearing a midi length skirt to work might not be completely appropriate, but if you can keep a few things in mind, the midi skirt can be transformed into the perfect workplace outfit for you. One of the most important issues when wearing a skirt to work, is to keep in mind the length of the skirt. You don’t want it to be too short, something you would wear casually with friends or to a party. You are, after all, in a professional environment. Keeping this in mind, the perfect length of a midi skirt would be one which stops at the knees. If you must go higher, be sure not to go higher than 3 to 4 inches above your knee. 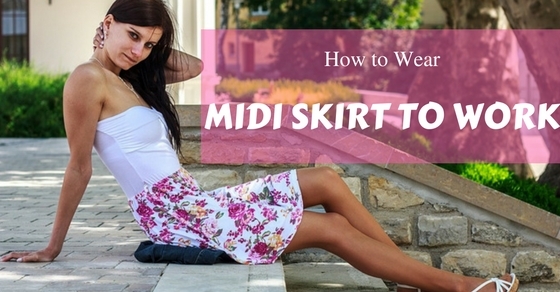 While womens midi skirts can be an extremely flattering look for women, since you are wearing it at your workplace, you must make sure it does not violate any of the workplace ethics. A midi skirt which goes too short might just call for unwanted attention, which is the last thing you want at a workplace. Texture can be just as important as the length of your midi skirt, if you are planning on wearing it to work. While sheer midi skirts may be the best look on you, this is not something which would be deemed workplace appropriate. Sheer skirts expose your legs completely, and that would not be a proper outfit to wear for the office. Thin textures or fabrics, sheer, see through fabrics are a strict no when it comes to the workplace. The textures which would be more suitable for the workplace would be thicker fabrics which don’t fly around as easily, and which are not transparent. You have to always remember to maintain certain decorum at the workplace. A lot of midi style skirts are available with long slits down the sides, or one side, or even the front. These might be perfect for the next party you are going to attend, but be extremely careful about the length and placements of those slits. Showing off more skin than you intended is not something which would want to get stuck with when you are at work. Remember that whatever outfit you choose to wear; you will have to last in it for the entire day. If your outfit feels in the least uncomfortable when you are leaving your house, the feeling of discomfort will just magnify once you are in that outfit the entire day at work. Any midi skirt which has a high slit up the sides is sure to expose extra skin when you sit down. Even if you wear stockings underneath, the slit will be visible and not necessarily the best look for you in a working environment. When wearing a midi skirt to work, make sure the skirts slits are not extending beyond your knee level. A slit down the front of the skirt would also be comfortable to wear when you are sitting down at work, so a slit on the side would be best in this case. Team it with a pair of stockings for additional comfort. While you want to look your best when you are at work, you also don’t watch to look too dressed up, or bring forth unwanted attention with super loud outfits. If you decide to go with a midi skirt which is printed, be sure to team it up with a blouse which is plain. Solid colors or even bold colors might be okay, but pastel, neutral shades with solid color would be the best choice. Since your bottom half is already highlighted with the prints on the midi skirt, you want to balance out the look by keeping the top half soft and subtle. Whatever style of midi skirt you have chosen for your particular days outfit, be sure to accessorize smartly, so that you look professional and chic, and not too gaudy for the workplace. If you have chosen a bold or printed skirt fashion for your outfit, make sure you pair it up with neutral accessories, and proper shoes, heels and belles. Avoid wearing sandals as they are not the right look for the work place. When you are picking out an outfit which is workplace appropriate, one of the most important things to remember, is to make sure your outfit is not too loud. While you want to look your best at work, you can do so even by choosing softer, subtle colors or patterns. With respect to your midi skirt, avoid wearing colors which are too loud and prominent, such as gold, silver, or anything which has a metallic sheen to it. Sequins and glitters also fall under this category. For your midi skirt outfit to be considered workplace appropriate, take a minute to think whether this is an outfit you would wear to a party. If you answer it with yes, then most probably, this is not the right choice of outfit for your workplace. Even if the sequins or glitter are in a neutral shade such as black, white or beige, ‘bling’ is just not considered a professional look, unless of course, you are working in the fashion industry. Then you can pile on the bling with no issues! The material of the skirt is extremely important while choosing a workplace appropriate outfit. Wearing a midi skirt made of a material which is too tight or too restricting will be extremely uncomfortable, as you might have to travel in public transport to and fro from work. You want to make sure that you are wearing something which will be of comfort to you throughout the day, no matter where you have to travel during your work hours. You midi skirt should be comfortable, smart and professional looking, as well as something which would give you the mobility you need throughout the day. Comfort should always prioritize over style. You might come out of your house thinking you look like a million dollars, but by the end of the day if you don’t feel like a million dollars, you know your outfit has given you hell through your day. A midi can be quite a pleasant change to see at the workplace. The length of the skirt is long enough to be considered appropriate or modest at work, and it also provides that feminine touch while most women crave and cannot get out of simple trousers. The midi skirt can be the perfect workplace outfit, and with a few tweaks here and there, can even be turned into a dazzling weekend outfit. The most important point you have to keep in mind while wanting to pull of just about any outfit at work, is remember to be confident. Be comfortable in the outfit you have picked out. While it is not wrong to step out of your comfort zone slightly, your workplace might not the best place for you to experiment these tricks. New trends and styles are developing every minute, and while it is natural for you to want to keep up with the latest trends going on around the world, you also have to remember to keep the integrity of the workplace in the outfit you are planning on wearing. The last piece of advice would be to just be yourself! Do not try out trends which the celebrities are trying out nowadays but you do not feel comfortable with. To look good in any outfit, you have to remember to be comfortable in it. Every individual is not the same, we all have our different styles. Be you, and the trend will follow you.